How about attending a vacation rental conference organized by your peers? How about listening from people like you, learning from their success, taking away real actionable advice? 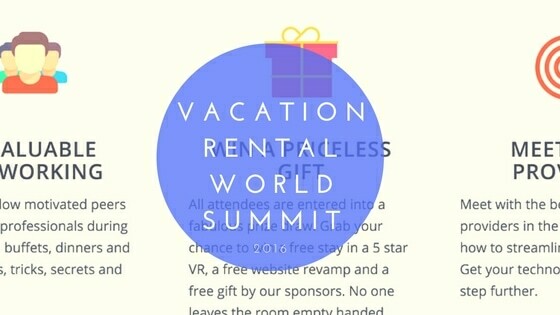 This is what the 2016 edition fo the Vacation Rental World Summit is about. I’ve already mentioned Antonio Bortolotti several times in this blog. He was of my mentors when I joined the vacation rental industry. I had written a blog entry about the online edition of Vacation Rental World Summit 2015 and included Antonio in my roundup article of 23 experts about vacation rental website design mistakes. Here, Antonio shares with us why, for the first time,the Vacation Rental World Summit will be an offline event, taking place in Barcelona on October 29th-30th, 2016. He explains what you can gain from meeting and interacting with your peers and why this year’s format is truly unique among vacation rental industry events (including the venue and the food!). I also asked him about listing site independence; his answer about the love – hate relationship with the big listing sites and OTAs is really interesting. 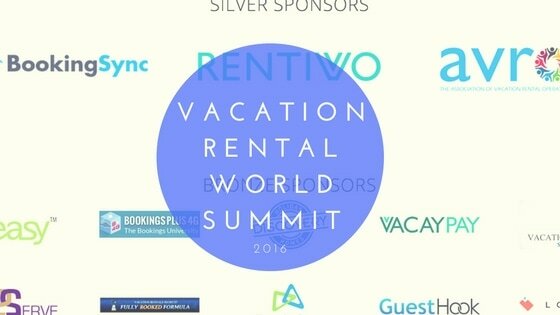 Antonio, you are organizing the 2016 edition of the Vacation Rental World Summit. The first two online editions gathered more than 15,000 attendees, professional managers and property owners from 49 countries. Now, you are going offline, with a meeting in Barcelona. 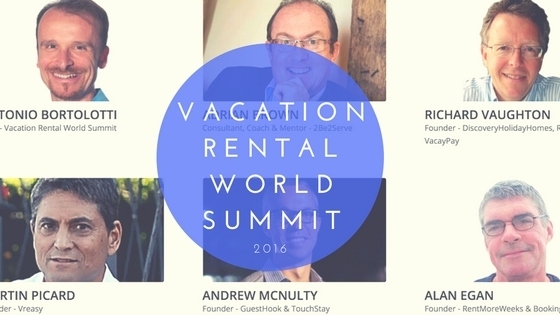 What has made the Vacation Rental World Summit so successful over the years? I think the answer is simple: successful owners and managers – or rentalpreneurs to use your beautiful term – know how dynamic the VR industry is and want to stay on top of their business to ensure their rentals keep thriving year after year. What makes VRWS successful is the fact that it is an event entirely created by property owners, property managers and acknowledged industry professionals with a proven track record of success and it’s geared entirely to fellow peers. In other words, it’s a collective gathering of tips, tricks, tactics and proven successful marketing strategies, as well as industry insights brought to you by fellow peers from fellow rentalpreneurs. There is a 100% focus on attendees here and everything is conceived to make the learning experience extremely valuable, entertaining and convenient. The fact for example that it’s been online so far, allows for a far wider reach, as it’s the Summit that comes to you and not the other way around. You learn and interact with each speaker and other attendees directly from the comfort of your home and that is quite unique and priceless. You also digest all content at your own pace, meaning you can watch each session over and over again until you absorb every nugget of it. So there’s no risk of losing anything. Attendees invest only one fee which is much lower than other industry events, to make it affordable to everyone. As a result, the investment requested by any participant is far more sustainable than that of other physical events, where you have to factor in the costs of travel, accommodation, food and all the extras. And last but not least, a money back guarantee to ensure attendees really take no risk. So all in all, a win-win for everyone. What makes the 2016 Barcelona Vacation Rental World Summit unique? How is it different from other events like the VRMA conferences? First and foremost, no session is concurrent at Vacation Rental World Summit. We find it quite unreasonable to push attendees to decide whether they want to attend session A or B, when they may want to attend both. It makes no sense to us at all and we’d rather offer less training sessions, higher quality and most importantly a guarantee that attendees won’t miss out on anything shared and therefore get a good return on their investment. We keep attendees in mind at all times. We’re property owners and managers first, so we know our peers have lots of expenses to cover to run their successful business and some events are a little overpriced. So we made attendance really affordable for everyone. We want to keep the interaction among attendees and speakers at the highest possible level. We want to get the sense of an extended family and community of likeminded rentalpreneurs who’ll have countless opportunities to network with one another over the weekend and share all their best tips to mutually learn and grow. We also believe in quality versus quantity. For this reason, we’re limiting attendance in Barcelona to maximum 100 participants. And chances are we’ll close registrations before reaching capacity, since we’re already nearly sold out, with rentalpreneurs coming from 17 countries as of today (most of Europe, the USA and Canada). Because we want the fun part of it as well and we want every attendee to leave the room happy and satisfied, we’ll run prize draws where nobody will be empty handed: attendees will have the opportunity to win a free stay at a luxury property we’ll reveal during the event, a free website revamp, a 1 on 1 consultation with a speaker of choice and a few more goodies we’ll put together. Another thing that sets VRWS apart is food. Barcelona is a foodies mecca, so rather than having the usual buffet lunch on site, we’ve organized 2 tasty lunches at an historical restaurant right on the Ramblas, just a 5 minute walk from the venue. This way attendees get also a chance to take a full break, walk out of the venue, breath some fresh air and enjoy the sun and the atmosphere of beautiful Barcelona. And they’ll taste some of Spain’s best known food: tapas on day 1 and seafood paella on day 2. All paired with complimentary Spanish wine and sangria! Another thing that sets VRWS apart from any other industry conference is the opportunity to stay in a rental property rather than the usual hotel. We partnered with Vreasy and Rentivo to offer a cloud area within VRWS website where attendees can choose between a selection of carefully vetted rental properties made available by some of Barcelona’s best hosts and property managers. On a side note, since we’re nearly sold out, most properties have gone already though, yet our philosophy is that of being true to our own business: as VR owners and managers it makes sense to stay in a VR during an industry event. It’s that simple. Are tickets still available and is it possible to attend online, just like during the previous editions? As we’re doing this interview, we nearly reached capacity, so we still have a handful of tickets available and we would encourage anyone interested not to procrastinate and secure one of the last tickets here. Besides, the current early bird price of €197 for the first attendee and €157 for an optional second companion will end on August 31st. From September 1st price will go up to €397. As for the possibility to attend online, we’ll do our best to make the recordings available after the event. Is independence from the big listing site possible and how can the Vacation Rental World Summit help achieve this? We believe that while listing site independence looks like a very alluring promise, the whole concept should be taken down to earth and approached with a different mindset: listing sites are simply part of any VR owner and Property Manager’s marketing mix and as such they do represent a further marketing channel which brings in business. How big their part is in a rentalpreneurs’s business is what really matters here. And that’s where VRWS comes in place, to teach you how to get more direct bookings, streamline your workflow and maximize your rental income. Realistically, very few rentalpreneurs can and will achieve a complete independence from listing sites, as this means an amount of work to be done on a regular basis which is beyond the scope of most peers for a number of reasons. And the increasing power of listing sites makes it wiser to identify better ways to use them in your favor and regain control of your own business while reducing dependence to the bare minimum. Any other thing that you’d like to share with the readers of RentalPreneurs.com ? We’re really excited to have brought VRWS to where it is today and we look forward to shaking hands with all those that will take the leap and join us live in Barcelona on October 29th-30th, 2016. When we started three years ago, we could not imagine to have impacted so many people’s businesses worldwide and for this we are truly, sincerely very grateful. We’ll do our best to keep delivering on our promise and honor our mission to help fellow rentalpreneurs as we’ve always done. We know many of the attendees that will be in Barcelona this year and can tell that the vibe in the room will be absolutely spectacular, so we hope to see you there too. How about you will you be attending this Summit? I will try, as it looks very interesting and I know that these speakers have valuable things to say. It will be just one week after the 2016 VRMA National Conference in the US. I will probably be a bit jet-lagged, but happy to be among my peers!